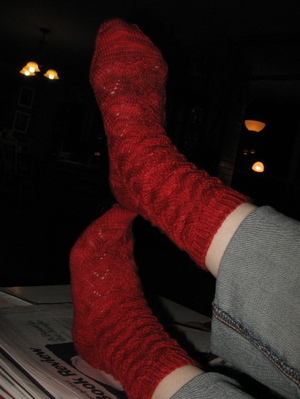 No lie, there's a point for me with every project where I fall out of love with whatever I'm knitting, get bored, and just want it to be over. Never happened here. I love everything about these - the color, the texture, the fit. 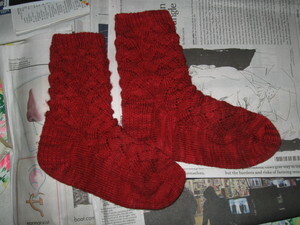 The yarn was a dream, and every step of the knitting was FUN. Kudos to the genius of Fleece Artist and Cookie! Foodwise, there's been some experimenting. As in, making things that aren't stir-fry. Or soup. 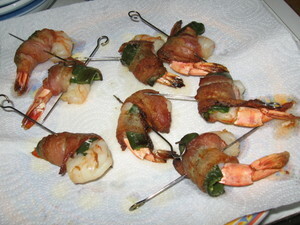 One of my all-time favorite appetizers is the Rodeo Bar's Cowboy Kisses - shrimp and jalapenos wrapped in bacon. Surprisingly easy to make - I used pre-cooked shrimp, with 1/2 jalapeno and 1/2 strip of bacon apiece. I suspect the restaurant version is deep-fried, but broiling works just as well. Is everything better with bacon? I strongly suspect that this might be true. Absolutely everything is better with bacon! I'm so glad to have indoctrinated you into Crif Dog love, but I think I may have to hit up Rodeo Bar for some Cowboy Kisses. You up for it sometime? late night trick: in my fridge are sandwitch bags with 3 pieces of bacon and 6 shrimps in each. i grab a bag, wrap the shrimp real quick, and drop them in a skillet. a few minutes, and a turn or two later... the best late night snack ever! 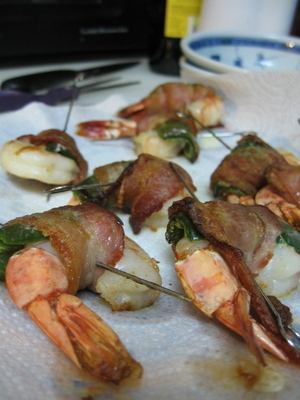 and you don't even really need the skewers, half a slice of bacon wraps around the shrimp JUST right. for new years dinner, i threw a bunch of asparagus in a casserole pan with some olive oil, garlic, rosemary and thyme. i covered the top of the pan with bacon... after it had cooked for a while i took the kitchen scisors and cut the bacon up into little bits, stirred it in, and let it bake for just a little bit longer. it was gone about 3 minutes after it hit the table. yes, everything is better with bacon.